The greatest challenge that the Paris to Hayling Charity Cycle Ride has faced in its 23-year history was met with outstanding success, during the week of 13th to 20th July. 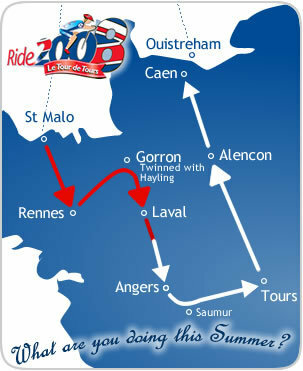 200 riders set out, 140 on the longer 6-Day 440-mile route and 60 on the 3½-Day route and they all enjoyed some fabulous weather and scenery, especially in the Loire Valley, the southernmost area ever ridden on the event. We are still the ‘Paris to Hayling’, but after 22 years of visiting either Paris or Versailles and having reached the phenomenal amount of £1,000,000 in fundraising last year, we thought it was time for a change – and how welcome it was! Every day’s cycling was different, with some shorter 50-mile days in the case of St Malo to Rennes and Laval to Angers, but also some more challenging days, such as the 88 miles between Rennes and Laval (diverting via our twin town of Gorron for a lunch put on by the Gorronais), a 95-mile day between Tours and Alencon (thankfully not too hilly!) and a mid-range 71-mile day to finish off, between Alencon and Caen, before our last night gala dinner party in Caen Castle, where we were once more entertained by the Crooners, a group we brought over from Hayling – and they did it for free! This was after a day when almost half of the riders sported fancy dress whilst riding, notably the Sussex Brewery Mime Team, the Cross Channel Faeries, Batwoman and Ghostbuster. Sadly, we had more injuries than normal, with four hospitalizations, two male riders having to leave for home early, another one with an injured arm, from which he recovered to keep cycling and one of our ladies came off, fracturing her arm, which was operated upon, but she was able to return with us on the ferry. Quite a few others had minor injuries to legs, knees and elbows, but were determined to continue and finish! The six days of new route were devised by a combination of eight committee members: Pete Alloway, Meryl Browne, Fred Dyer, Sarah Farmer, Lynne Harris, Tony Hart, Rick Hutchings and Jon Tawse, with their superb efforts contributing hugely to this year’s successful ride, much appreciated by one and all. Pete McQuade did a great job of the mammoth task of booking 32 hotels in all of our destinations and the brilliant baggage handling team of Rick Gibbs, Mike Harrington, Dave Hersee and Mark Cook worked with great aplomb, notable for only misplacing one bag all week, soon resolved! Meryl Browne is to be congratulated for ensuring the last night’s party was enjoyed by all, with dancing into the early hours, after hundreds of miles on the road! Kerry West has contributed tirelessly throughout the year, dealing with rider communications and a host of other tasks. Rod Elliot put in a bravura effort as Support Crew manager, never relaxing until everything was all in order for each day, right up until the end.